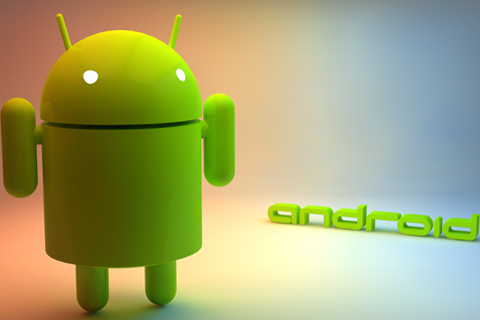 Since you can customize almost every part of Android you can have many different experiences while using the same Android device. Widgets customization is one of the coolest features on Android. Customizing Widgets allows you to access information quickly without having to find and open the apps you want. Widgets is one thing you should be using on Android and I will recommend some apps I use to get the best widgets on my Android. If you missed part one of my series on customizing Android you may want to go there because I talk about what customizing Android is all about and why you may want to customize your Android device. I also explained what a Launcher does on Android and gave a list of Launchers that I think are the best on the Play Store. Widgets are one feature in Android that you can’t have on iOS. 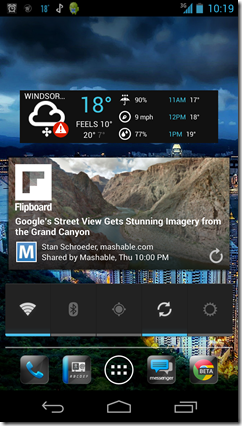 There are several different ways to get widgets for Android. First Android comes with a basic set of Widgets that you can use and usually include a clock, calendar, email, contacts, etc. If you have a newer version of Android you will have more widgets available. Depending on the Apps you have installed you can also have widgets for each of the apps you have. There are also many different apps available on the app store that have premade widgets for you to use and these can include anything from weather widgets to news widgets. You can also make your own widgets if you want to customize your screen even more and cannot find a widget that will work you can use these apps to make your own. To add widgets to your homescreens you either long press on a blank place on the screen and select widgets or go into the app drawer and hit widgets on the top of the screen. From here you will see all the widgets that you have available. I suggest trying all the widgets at least once to see which ones you want to show. Most apps on the Play Store have a widget along with the app which is very helpful especially for apps that you want to start quickly like; news and readings apps, weather apps, and music apps. Now if you are not sure what type of widgets you want to use then I would look at the widget apps below and see if any of them would your Android device. 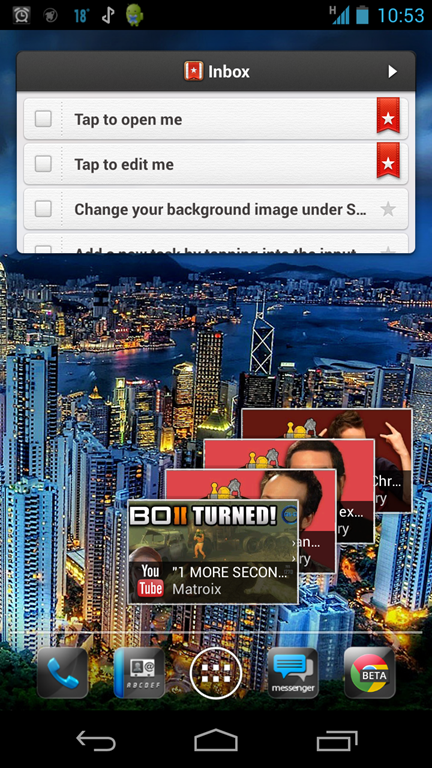 Here are some of the widgets I use on my Android phone. 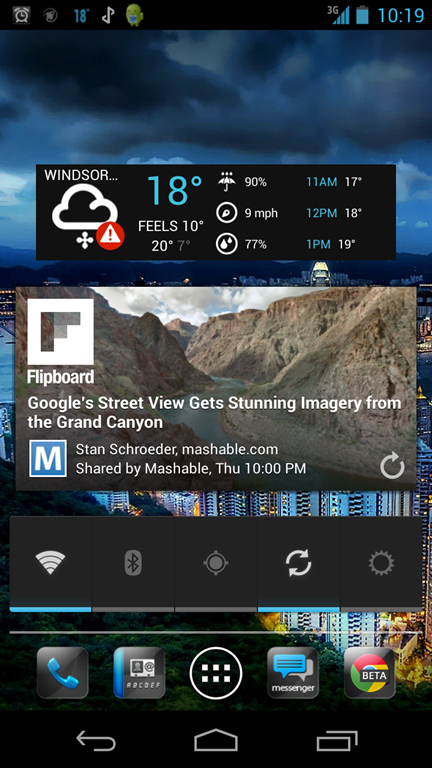 Widgets above are 1Weather widget, Flipboard widget, Power Control widget in the Left Image. 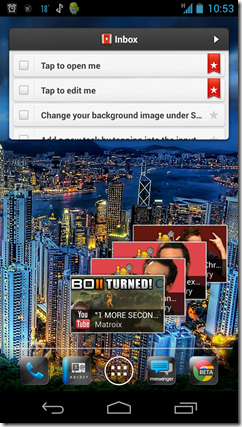 Right image shows the Wunderlist widget and YouTube widget. Beautiful Widgets – This is one of the best widget collections on the Play Store. Multiple widgets are available for displaying a clock, the weather, your battery percentage, the current date or accessing some system settings more easily with toggles. More than a thousand free themes to beautify your widgets. You will be able to do multiple combinations with clock, weather, battery and toggle themes. Beautiful Widgets is available in the Play Store for $2.69 and is an app to check out if you want total widget customization. Fancy Widgets – Personalize your Android home screen with highly customizable clock widgets, weather widgets, home (clock & weather) widgets, forecast widgets, and more with lots of customization options. This is a good app to get and try to see if you like the way their widgets look you can customize the widgets and have quite a few to choose from. Fancy Widgets has a free and premium version of the app and you can find them on the Play Store. You may not be aware that the great apps you have on your Android device come with widgets built in so you can access the app from your homescreen without having to open the app. Having a widget of apps is very helpful for any apps that give information such as social network apps, news apps, or music apps. Here are some of the app widgets that you should be using if you use the app.